We wanted to spend some time in the world-famous New Orleans French Quarter. We hoped for a quality hotel that was right in the heart of things but where we could also get a restful night’s sleep. The Maison Dupuy, just two blocks from Bourbon Street, was the perfect fit. With comfortable guest rooms, complimentary WiFi, a bistro, courtyard, poolside cabanas and heated swimming pool, the Maison Dupuy fit all our needs and desires. We even had a balcony overlooking the French Quarter! We had breakfast with Maison Dupuy Area Director of Sales and Marketing Craig J. Sanders and asked him to tell us more. How would you describe Maison Dupuy in one sentence? The Maison Dupuy is a unique New Orleans hotel in an ideal location with a beautiful courtyard and old world charm fitting the historic French Quarter. 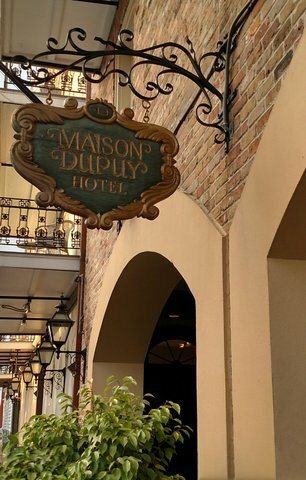 What can you tell us about the guest rooms and amenities of Maison Dupuy? Our French Quarter hotel continually sets the standard for New Orleans luxury accommodations. Many of the guestrooms offer balcony viewing of the French Quarter or the hotel’s beautiful courtyard. From the moment you awake each morning, you are treated to the comforts of home and pampered by a staff committed to creating a memorable New Orleans experience for you. How would you describe the Bistreaux at Maison Dupuy? The BISTREAUX at Maison Dupuy is a casual concept that delivers a comprehensive dining experience in a relaxed and comfortable atmosphere. The four core elements of the experience include food, drink, music and affordability, amendable for the season and patrons. The BISTREAUX at Maison Dupuy offers breakfast, lunch and dinner daily making it an attractive destination for hotel guests and French Quarter residents alike. A backbone of foods found throughout the continental United States as standby-items that are popular through familiarity are adjusted for that local influence. The result is 'inspired comfort food.' The food leaves diners satisfied with something familiar and excited by the unique execution. The drink element includes a full service bar offering fun and contemporary spirits. Traditional top shelf brands form the basis for both standard and innovative concoctions. Local favorites are well represented, as well as local brands. We emphasize quality and value oriented selections by the pour, glass and bottle. Why is the French Quarter such a popular destination? New Orleans is one of the world's most fascinating cities – it is home to a truly unique melting pot of culture, food and music. New Orleans has more the flavor of an old European capital than an American city. Visitors particularly remember the decorative cast-iron balconies that cover many of these townhouses. European influence is also seen in the city's famous above-ground cemeteries. These hugely popular "cities of the dead" have been and continue to be an item of great interest to visitors. One of the truly amazing aspects of New Orleans architecture is the sheer number of historic homes and buildings per square mile. A new streetcar line has just opened on the western border of the French Quarter, Rampart Street, just one half block from the Maison Dupuy Hotel. The streetcars in question, the St. Charles Avenue line, represent the nation’s only surviving historic streetcar system. All of its electric cars were manufactured by the Perley Thomas Company between 1922 and 1924 and are still in use. Hurricane Katrina flood waters caused severe damage to the steel tracks along the entire uptown and Carrollton route and had to be totally replaced and re-electrified. The cars themselves survived and are included in the National Register of Historic Places. New Orleanians revere them as a national treasure. The Maison Dupuy Hotel is located at 1001 Toulouse Street, New Orleans, LA 70112.